Currently gracing the walls of the New York Studio School gallery are the paintings of two accomplished mid-career artists who both paint abstracted images inflected by elements of the real. Their philosophies of painting, however, are very different. Filling one of the gallery’s two rooms, Eve Aschheim’s small canvases reveal a process of steady probing, with fine lines and carefully considered shapes set against smoothed layerings of white; suggestive but never descriptive, her forms accrue as a kind of cerebral poetry. In the second room, the surfaces of Ying’s Li’s small to moderate-sized canvases swirl with thick strokes of paint applied in every color and tone; her subjects are far more readily apparent—one experiences coastlines, still lifes, landscapes—but these emerge through torrents of struggle. The inspired pairing of the two artists highlights the fact that two painters, pursuing their art with equal ardor, can reveal utterly different notions of the rigorous. Ms. Aschheim’s canvases hum with the allusive potential of marks: indications of motion, presences—or, perhaps more accurately, situations—arising out of subtly reworked, almost pearly depths. Lines radiate and scatter, or sift in fragments through space. Everywhere one senses the artist’s diligent attention. What might a line do here? What would it say to this form here? The viewer absorbs this process of richly accumulating associations: the openness and searching of scattered lines; the conversations between paired forms, the transience evoked by scraped-down surfaces. The separate sensations gather as mysterious, multivalent impressions. Sometimes a title reinforces the effect: in “Pinch” (2013), a vertical passage of white succinctly clips lines angling across the canvas’ width. 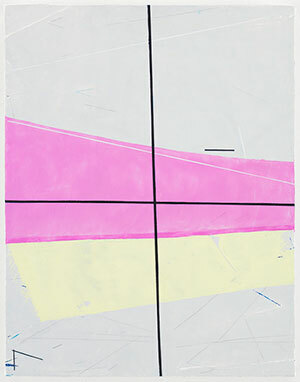 Lines intersecting like cross-hairs, and horizontal flairs of pink and yellow, take on added intensity when one realizes another painting bears the title “Bullet” (2103). If Aschheim’s paintings are meditative probings, Ying Li’s paintings are voluptuous declarations. Ms. Li’s turgid technique initially catches the eye, but beneath it lies a discriminating impulse: a strong sense of the pictorial weight of colors and forms. Each color pressurizes the adjacent ones; the drawing energizes these intervals within the canvas’ rectangle. In a painting like “North Chatham (Andy’s Path)” (2011), one sequence—an elusive blue-green gray; a brilliant, acidic yellow-green; a richly absorbent bluish-black—anchor the impression of a foreground tree arching momentously about a path’s distant bend. Even where the subject barely emerges from the maelstrom of paint, as in “Winter Lilies of Hanover #1” (2012), plastic forces continue to articulate: a vacant greenish-white holds before our eyes, a hard pinkish-white props itself above; together they shunt a variety of sturdy blues into remote depths below. Rather than presenting scenarios, Li’s paintings embody them. This eloquence of form, however, is doubly camouflaged: once by the paradoxical nature of the best representational painting—from Chardin to Picasso—which locates a subject‘s inner character ultimately in abstract forces; and secondly, by the seductive technique that may encourage some viewers to look no further. 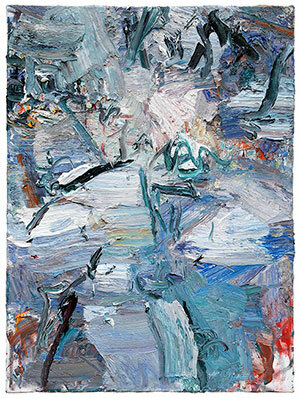 For me, if Aschheim’s works resonate as excursions in process, Li’s paintings resound as experiences of form. I find Li’s approach closer to traditions pursued by Titian, Mondrian, and Matisse, and Aschheim’s closer to the contemporary interests in the semiotics of mark- and shape-making, with Malevich, Newman and Twombly, perhaps, as antecedents. In any event, the Studio School’s exhibition presents a memorable sight: Aschheim’s self-contained search for unbounded associations, next to Li’s unbounded search within a self-contained language.